The Radius BZ1 will run for 7 to 8 consecutive days on a single battery charge. This reduces the need for attendants to change the instrument’s battery and bump test it, from once a day to once a week. In addition to lowering labour costs, the less frequent access to the hazardous area reduces risk exposure. By keeping a couple of monitors charged and on reserve, they can be rotated into the network as needed, eliminating downtime. To automatically re-charge and bump test an instrument, simply pull out the SafeCore Module (central processing unit of the monitor), and insert it in the DSX Docking Station. As a side benefit, the 7 to 8-day continuous monitoring pattern helps to reduce the number of permits required for attendants. Easy setup eliminates common frustrations and wasted time. The monitors are ready to go to work right out of the box. Simply turn them on and strategically place them around your hazardous area for continuous monitoring. Your Radius BZ1 monitors equipped with LENS Wireless technology, start communicating with each other immediately, without the need for IT, licenses, or additional infrastructure. If one instrument alarms, all others that are part of the same network will pick up the same reading. 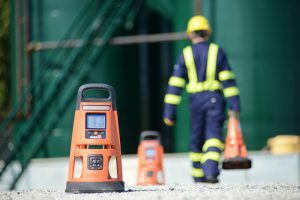 As an option, Industrial Scientific’s Ventis Pro Series personal gas monitors, also equipped with LENS Wireless, can be easily added to the network by turning them on and setting them to the same channel to provide a moving point of network surveillance. A rental option facilitates planning and eliminates the need to make a long-term investment. The temporary and dynamic nature of your plant turnaround project makes it suitable for short-term Rental. The date of delivery as well as exact number of monitors required can be finalised last minute. Your rental fleet will provide you with the right number of monitors to create a continuous safety network around your hazardous area for the duration of the project. If you need to add another monitor on the fly or you have an instrument that has been damaged or has failed, a new one can be shipped in less than 48h, eliminating downtime. Every monitor in the fleet is serviced by Industrial Scientific employees and will come to you pre-set with your specifications.